You can almost watch it come to life on the page: In the sprawl of Bangkok, an illegal dump the size of a large city block was scraped clean, sculpted, and planted thickly with 60,000 trees, many of them quite small. It now looks thick as a rain forest, with an elegant skywalk overhead and cobras on the ground (which is why you’d use the skywalk). This remarkable reforestation project, called the Metro-Forest, by Landscape Architects of Bangkok, repatriates more than 275 species once common enough locally, as James Trulove reports, that sections of the city around it bear their names. Thick as it appears, it’s only getting started. The plan is for the trees to engulf the skywalk in their canopy. How to describe the vindication of taking an embarrassed site and bringing back some form of its original dignity? “Strangely exciting,” is how Gwendolyn McGinn, Associate ASLA, puts it to the reporter Anne Raver in this issue. McGinn, of Studio Outside, in Dallas, is working at the Tylee Farm in Texas, not far from Houston. The farm holds what is left of southern post oak savanna that was overturned and grazed nearly to death since the mid-1800s. With Studio Outside’s founder, Tary Arterburn, FASLA, and Amy Bartell, a project manager, she is working to restore the many ecological segues the site once had for newish residential owners who want to live well—as long as their land does, too. 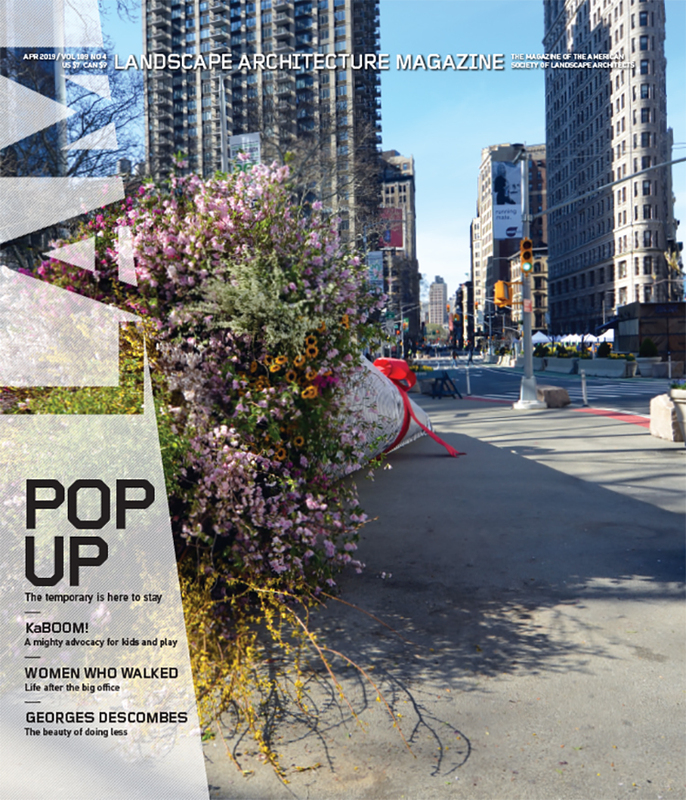 Also in this issue: Staff writer/editor Katarina Katsma, ASLA, writes about the interlocking of plant science and aesthetics in the designs of Sandra Clinton, FASLA, in the mid-Atlantic; Jeff Link looks at the fine points of poured-in-place rubber playground surfacing; Karl Kullmann considers the new heights of drone mapping; and Jane Gillette reviews City of Refuge: Separatists and Utopian Town Planning by Michael J. Lewis, a book that will leave you thinking about squares. The full table of contents for May can be found here. Credits: “Control of the Canopy,” Rungkit Charoenwat; “Side Pocket,” By oinonio [CC BY-SA 2.0] via Flickr; “Along for the Ride,” Gwendolyn McGinn, Associate ASLA; “Color and Cushion,” Site Design Group; “The Right Fit,” Huguette Row. Launching a design firm is not for the faint of heart. In building a landscape architecture business, mobile tech and shared work spaces have changed the game, but some things remain the same—long hours and total dedication are a given. Kevan Williams talked to more than a dozen young firms about what it takes to take the leap in a postrecession world and what keeps principals up at night. If big demands take time away from design, they also deliver independence and professional growth. Principals talk candidly about finding balance, building on experience, and focusing on a few key elements among other backstage insights. Steve Durrant, FASLA, is a bike evangelist, and that makes him a bike lane evangelist, too. Fred Bernstein profiles Durrant and his firm, Alta Planning + Design, about the current state of our bicycle infrastructure. Chicago’s Riverwalk is a triumph of patience and public landscape design. The work, by Sasaki, is an insertion into the long-used but somehow underutilized spaces along the channelized Chicago River that runs right through the heart of the city’s iconic Loop. In the Foreground, Timothy Schuler looks at the emerging questions about aesthetics and renewable energy. Can we—and should we—make wind and solar farms look better and relate more meaningfully to the places where they are increasingly part of the economy? Allyn West looks at the opportunity that drought and tree die-off made in Houston’s urban forest in Ecology. Now has student-creature design collaborations, a park design that enlarged after a social media takeover, and a Baltimore firm using a development requirement in an innovative way to provide a community benefit. The full table of contents for March can be found here. Credits: “Start Your Engines,” Brandon Stengel/http://www.farmkidstudios.com; “Walking the Walk,” Christian Phillips Photography; “Pedal Harder,” Michael Hanson; “The Upside of a Die-Off,” Design Workshop, Inc. and Reed Hilderbrand; “The Art of Infrastructure,” Robert Sullivan.